The TC200-JVC-BN-VF823-I-TDM from Dolgin Engineering features integrated battery plates that support the JVC and third-party BN-VF823 batteries. These batteries are used with JVC's GY-HM100U, GY-HM150U, and GY-HMZ1U cameras. 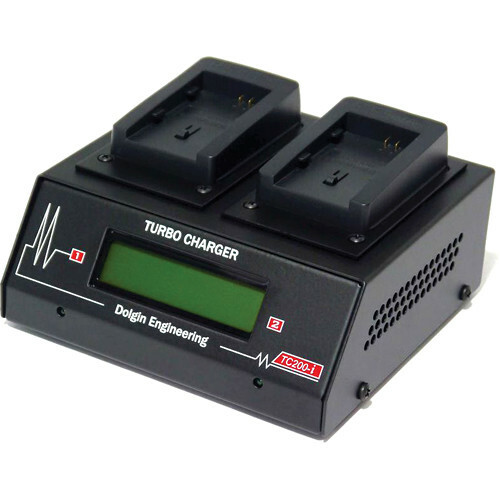 The TC200-i-TDM has an LCD screen on the front panel that displays charge status in volts, amp hours, and percentage of charge that's estimated using a proprietary algorithm. There's also an auto-detecting USB port for charging/powering mobile devices at the same time as you charge your batteries. The TC200-i-TDM is also designed with a built-in test/discharge module that allows you to determine whether a battery is new or old, and whether it's on par with its label. The TDM feature cycles the battery (fully charges and discharges it) and then provides a report on its capacity. The TC200-i-TDM has fully independent channels and provides simultaneous charging of both batteries. Based on a capacity of 5600mAh, this particular model delivers a complete charge in approximately 2.5 hours for both batteries or when you charge a single battery. The charger comes with a US power cord and supports worldwide power input via optional plug adapters, as well as 12 VDC car lighter power via an optional car lighter adapter (model # DE_CAR_12). Box Dimensions (LxWxH) 10.0 x 7.0 x 4.0"